Spring is the season for some of my favorite vegetables: asparagus, arugula, artichokes, and sweet peas. I love shopping farmers’ markets for fresh picked and unusual varieties. California has a town called Castroville, up on the central California coast, where it’s nice and foggy much of the year; the perfect place for The Artichoke Capital of North America. (Of course, their sign says “Artichoke Capital of the World!”). Artichokes are in the thistle family, which also includes medicinal plants, such as Milk Thistle, the source of liver protective, cancer fighting and inflammation controlling plant chemicals silymarin and silibinin. 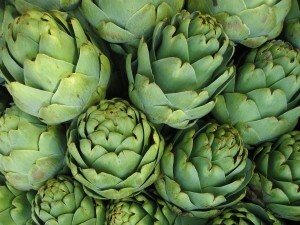 I will bet you had no idea that artichokes themselves have been studied for their effects on cancer. In particular, plant chemicals in artichokes have been shown to be active against tumor cells in liver cancer, breast cancer and colon cancer. They seem to not only have inflammation control properties but also can signal cancer cells to die, as well as decrease the ability of cancer cells to invade surrounding tissue and spread. Traditionally in North American Herbal and Naturopathic Medicine, artichokes have been used as part of formulas that enhance liver and gall bladder detoxification along with dandelion, beets and milk thistle. 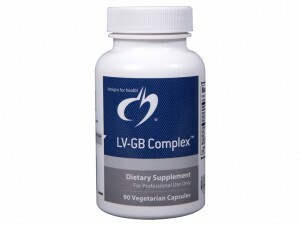 (You can get all of these natural supports in a supplement called LV-GB Complex). I enjoy fresh artichokes by simply cutting them in half lengthwise, steaming until tender and the leaves pull off the stem easily. I serve with a simple dipping sauce of olive oil and lemon. Of course, you can add garlic and basil! I also buy marinated artichoke hearts in glass jars and add them to salads and vegetable dishes. Whoever thought artichokes were so amazing?! 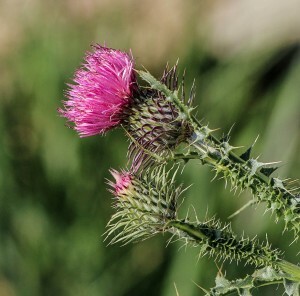 Milk Thistle, the sister plant to artichokes, is one of the most studied and potent detoxifying agents, actually used in emergency rooms to treat cases of liver poisoning. 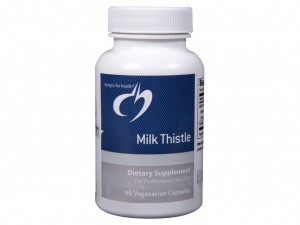 Milk Thistle is excellent for supporting normal liver detoxification function and normal inflammation control. Milk Thistle has also been widely studied for its effects on a wide range of cancers, including prostate, skin, liver, colorectal, ovarian and oral, to name a few. I use Milk Thistle with patients undergoing chemotherapy to protect the liver and kidneys from damage by free radicals and oxidative stress, as well as when liver toxicity is evidenced by elevations in liver enzymes. Oncologists rarely have a solution for this toxic side effect. Milk Thistle to the rescue! For using Milk Thistle in these circumstances and conditions, please do so under the guidance of a health care provider. In California we have a sister plant called Milk Vein Thistle, Silybum marianum. In the spring time I harvest the fleshy leaves of this wild herb flying its colors with a hot pink thistle flower. I juice the leaves and mix with fresh vegetable juices such as celery, carrot, spinach, parsley and add a splash of fresh lemon juice and often some fresh mint as well! That is really food as medicine! As Spring is the season of the Liver in Chinese Medicine, what could be better than harvesting fresh herbs that support liver health (such as dandelion greens, watercress and garlic greens, fresh mint)? Of course, you an always supplement with Milk Thistle Capsules to get these incredible benefits if you don’t have them growing in your backyard! Recommended dosage: 1-2 capsules 2-4 times daily with food.